Accommodations at Youngberg Hill are luxurious with four king suites and four queen guest rooms. The Inn provides guests the opportunity to explore the 22 year old organic vineyard and to taste our estates award winning wines. Youngberg Hill will take your breath away with the most beautiful views, warm luxurious Inn, personal and impeccable service and exceptional estate wines. Youngberg Hill provides the perfect location for those seeking a quiet, romantic getaway and a great base for touring Oregon wine country. The spacious house features four suites and four luxuriously appointed guest rooms. All rooms have private in-suite baths, comfortable chairs to relax in and enjoy the views. The house is centrally heated and air-conditioned. For the guests’ enjoyment, on the first floor you will find a library, lounging salon and large dining room. 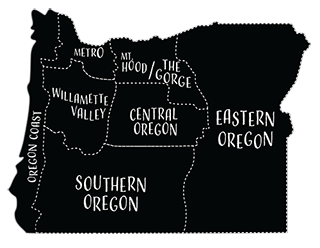 The entire house is encircled by covered decks overlooking our vineyard and the valley to the Coast Range, Mount Jefferson, Mount Hood and the Willamette Valley.